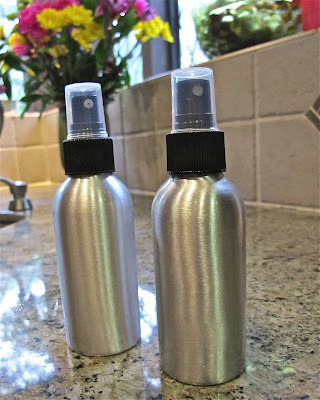 delicious wife: bug be gone: homemade all-natural and non-toxic bug spray! since i make bug spray and cleaning spray, i've been going through lots of spray bottles. most of them are bottles i've collected with the intent to reuse. they all seem break. i'm spraying away, and they just stop spraying. super frustrating when i've promised my kiddo a trip to the park or i'm cleaning minutes before mommies show up for a playgroup! it turns out the vinegar, alcohol, and essential oils corrode and clog the nozzles. after trying a few bottles, i've found one that works! it's a chemical-resistant spray bottle that's made to handle homemade chemical concoctions. you can buy them here. go ahead and get the three pack. you think you don't need that many, but you'll use them. i use them for bug spray (home and each car), cleaning spray (every bathroom), and a light hair-conditioning spray (before a blow-dry). i know, i get carried away with the sprays! most insect repellants use DEET as their active ingredient. DEET is known to cause diffuse brain cell death and behavioral changes in rats...you don't have to know what that means to know that its sounds bad, read this. in humans, the use of DEET can penetrate the skin and be absorbed by the circulatory system and may cause severe toxic reaction and in some cases death, especially in infants and children. there's no chance i'm using that stuff on my toddler...not even on my dog! now, if your spending lots of time outside and you live in humid area where mosquitos carry west nile, malaria, and dengue, by all means use DEET, lots of it cause the benefits far outweighs the risks. however, if you're just gonna be out and about, there are healthier options. did you know bugs are attracted to you because they like the way you smell? DEET works by masking your odor and making you "invisible". but, DEET isn't the only thing that works. 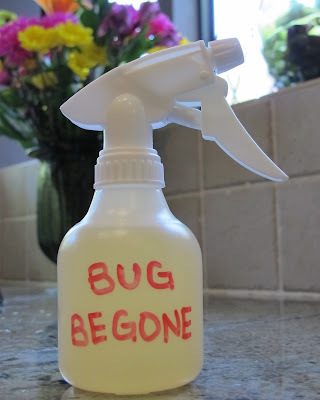 you can make a safe and non-toxic bug spray at home using common household ingredients. i had planned to show you before and after pics of my arm with and without "bug begone". i walked outside my front door, and those blood suckers took off immediately. i didn't even have a chance to spray my arm. holding the bottle in my hand was enough to make them scram. seriously, its works! i use apple cider vinegar and lavender essential oil. apple cider makes a powerful bug spray. it does have a slight vinegar smell, but it diffuses after a few minutes. if you can't stand the smell of vinegar, you can use witch hazel instead. because it's natural, no poison here, you'll need to reapply every hour or so if you're out and active. but, hey, that's a good trade-off! in an 8 oz spray bottle, add the distilled water, apple cider vinegar, and essential oil. shake bottle and it's ready to use. you can double the recipe for a 16oz bottle (what i do) or cut in half and funnel into a 4 oz bottle (perfect for the car, purse or diaper bag)! think you might try it? what other personal/cleaning products do you use or have a recipe for? take a look at my amazon store for other products i love! this post has been selected to be featured on BlogNation's Personal Blogs. follow the link and vote for me! We use lemon balm as an insect repellent. Just rub the leaves on skin and it works great and for hours. The leaves have a high citronella content. We have containers w/ lemon balm everywhere and it grows like crazy. i'm totally going to try that! thanks for the tip. MUST the water be distilled? hi Lisa, that's a good question! perfumer used distilled water, because the minerals and impurities that are in tap water can react with the essential oils to make them less potent and may even change the smell. i've seen bug spray recipes that also contain alcohol. perfumers also add alcohol to their recipes which aid in a quicker evaporation of water on the skin leaving behind the oils. between you and me, i've used tap water when i don't have distilled water laying around. it works just fine! Another good thing to use on cockroaches is soapy water in a spray bottle. Kills them in about 30 seconds. And, to keep roaches away you'll want to use bay leaves. They are very cheap and you can get a big bag of them, step all over the bag to break them up and sprinkle them around. Catnip works as well! i hear a lot of good things about combating bugs with soapy water. i'm gonna try this! oh yes, bay leaves could do the trick. thanks for sharing the tips! TODAY I READ THAT THE WAY TO GET TICKS OUT OF HUMAN OR ANIMALS AFTER THEY HAVE BURIED IN IS TO TAKE A COTTON BALL AND PUT SOME ANTI BACTERIAL SOAP ON THE COTTON BALL. THEN APPLY TO THE TICK AND MOVE IT AROUND AND PAT IT FOR AT LEAST 30 SECONDS TO A MINUTE AND THE TICK WILL BACK OUT AND BE ON THE COTTON BALL WITH ITS ENTIRE BODY IN TACT. WORKS FOR THE DEER TICK WITH THE WHITE SPOTS ON IT TOO. ALSO, I USE A ONCE A SUMMER BAG FROM LOWES OF TICK, FLEAS, BUGS, REMOVAL. YOU PUT IT DOWN ALL OVER THE YARD JUST BEFORE A BIG RAIN IS COMING AND THE RAIN MELTS INTO THE EARTH AND I HAVE BEEN USING IT 4 YEARS NOW AND IT WORKS. I DON'T LET MY PETS GO OUT AFTER PUTTING ON THE YARD UNTIL THE RAIN HAS SATURATED THE GROUND SO THEY WILL NOT GET IT ON THEM. THIS WORKS. THE BAG IS LIME GREEN AND YELLOW. CANT THINK OF THE NAME BUT IT IS NOT EXPENSIVE AND IT WORKS. The tick with the white spot is the lone star tick. Deer ticks are reddish brown and black. The cotton ball/alcohol method would make the tick throw up, thus injecting any kind of disease the tick may have directly into your bloodstream. Where can I find the essential oils? i buy my essential oils from Whole Foods, local health food store. you can get them online too. just be sure you get pure essential oils. let me know how you like it! what brand do you buy? thanks! the brands i use are Wyndmere and Now...both from Whole Foods. however, i think any brand will do as long as they are pure essential oils. I bought essential oils at Foodlion. my biggest problem is ants.. little black ones that go after meat and sugar.. any suggestions please...? hi aminah! we've had tons of rain recently here in Houston, TX, so the ants have been getting into the house (sugar and fire). because i have a toddler, i wanted to take care of this problem quickly. i called Nature's Own Pest Control to handle it. they spray peppermint, spearmint, and rosemary essential oils around the perimeter of the home and in the cabinets. i read that i could do it myself by leaving a few drops around the trash can and in the pantry. An old timer told me to get the chalk you put on baseball fields and go around our house once sprinkling it and on the base of all doors. Ants will not cross it. I did this three years ago and have not had an ant back in the house. This really works! You can also mix Baking Soda and Icing Sugar around the outside of your house. The sugar lures them in, the baking soda makes their tummies explode. Black pepper works for ants as well, not sure about the kind of ants, but I use it here in Ontario Canada and they don't come through the door. An amazing way to keep ants away is to sprinkle talcum powder near their holes or where they come into the house. I had a mini invasion last spring - an ant even drowned in my glass of water - but talcum powder worked instantaneously! hi kat! i hate spiders most essential oils deter spiders. you can spray the bug begone around your home, but because it's natural, it will wear off quickly. so, respray every few weeks or so. read Dr. Carol's warning below! she says if you have cats, do not use essential oils...toxic! Just read today that spiders and there was a photo of the bad ones hate peppermint. so you could put peppermint oil or maybe with children peppermint oil from the store that is edible and i even thought about putting peppermint candy in my linens and closets. that part may or may not be good but it definitely said spiders and the photo was a brown recluse. hope this helps. read today that spiders hate peppermint. they even had a photo of a brown recluse by the article. i am going to try this. you can put essential peppermint oil on cotton balls and put them wherever you want. even in your clothes drawers, etc. Put conkers around the house (keep a few in the fridge so they stay fresh and can be used to renew the ones that dry up) and spiders stay out. I cannot guarantee 100 %, because I live on the sixth floor and don't get many in the house anyway, but since I did the conker trick I haven't had any at all! Conkers are horse chestnuts, and maybe ordinary chestnuts work too, but they also form maggots! I've heard that houses built with chestnut beams don't get spiders, so that sounds promising. would it work on bugs on vegetables? no matter if you do this or buy your produce from the store, always rinse them well before eating! when you get your produce and fruit home use 1/3 part of white or cider vinegar to 3 parts water and let sit for about five minutes. then rinse and refrigerate. the smell goes away in about 15 minutes and the berries and fruit keep up to 2 weeks and the bacteria is gone from the fresh vegs and fruit. that's too bad! because it's essential oils and they wear off more quickly than DEET and picaridin (which i don't like to use), you have to reapply more frequently. also, essential oils react with the natural oils on your skin. perhaps you can try eucalyptus or peppermint. i love it, and it works for my family. reapplying is key! I have seen somewhere that if you are going golfing, hiking, just walking outside you can put a fabric softener in your pocket and mosquitoes will not bother you. gonna try it this year. they love me. I would NOT use this on pets, citronella and tea tree are toxic to them. thanks for the warning! i appreciate it. I heard on tv this week that you can rub orange peel on your pets and it will keep the fleas off of them. good luck on this. ewww...black widows freak me out! if you think you have a problem with poisonous spiders, call an expert. essentials oils will keep most bugs at bay, you'll have to reapply often. Why do we need distilled water. Will filtered tap water work? Thanks. to be honest, i use filtered tap water, because it's convenient. distilled water is recommended because a great deal of the impurities and minerals have been removed. impurities and minerals can mess with the smells and effectiveness of the essential oils. however, we're not making perfume and this recipe does have vinegar in it, so tap water is just fine! in fact, i think i edit it, so others won't have the same concern. thanks Dr. Carol! i appreciate the warning. this isn't something i thought of, because we don't have any cats in the home and our dog only gets a light spritz when we hit the trails (which doesn't happen often). i'll add it to the posting so others will be aware of the toxicity to cats. i want all of our furry friends to be happy and healthy! Rub your pets with orange peels to keep the fleas away. Why are there no capital letters used in your sentences? it doesnt matter about the capital letters it is the content of your comments that matter. keep up the good work. we have lots of bugs around our home as well. i called in the professionals, because i can't stand all the spiders and silverfish. we use Nature's Own Pest Service. they spray a mixture of mostly rosemary oil, spearmint, and citronella around the house. they also place borax under the deck and around the doorways and garage. i'm sure this is something i could have done, but i didn't want to mess with it. if you have pets, be careful of using essential oils. check with your vet first. melissa I realize this year I no longer have problems with spiders & bugs. I live on the lake and always had a problem with spider webs , huge ones on my porch posts. I have seen lizards crawling up my brick & outside running around on the walks. I do live where there are fields around. I have mice and rats, outside. I have been told to put moth balls around my house outside. If I did that would it run the lizards away? They seem to be very beneficial, keeping bugs and spiders away. I'm so bummed. I have a spider problem in my basement bedroom, killing several each hour, also pincher bugs but I am also a crazy cat lady having 4 of them that snooze on my bed. You'd think they'd help with the spiders ey? Anyway I'm not sure how to rid the spider problem because I don't want to use chemicals around them nor myself and now reading that essential oils are toxic to my furry children I'm at a loss as to how to get rid of these horrid things. I'm seriously losing sleep at night because that's when they come out. Can you suggest any other options I can try other then the shoe method? Thanks, and I love your blog! Just made mine and it smells really good. I used the witch hazel and citronella oil. Thanks form sharing! i hope you like it! witch hazel and citronella is a great combo...the strongest! You've performed a formidable process and our entire group shall be thankful to you. it, you're a great author. I will make certain to bookmark your blog and will often come back down the road. I want to encourage continue your great job, have a nice weekend! to generate a top notch article… but what can I say… I put things off a lot and never manage to get nearly anything done. Any chance this will work to deter wasps? We have a lot around and I am allergic. Thanks! Do not apply oil of any kind without diluting. It can plug pores which then cannot sweat properly, overheating the horse. Apply anything under the eye, not over it. If it rains, or the horse sweats, it will run into their eyes and aggravate. Same with the ears. Fly masks with ears will give you full head coverage without the chemicals. Avoid the cheaper ones with the fleece nose bands. Boy, can they every promote some nasty skin infections under there! Feеl frеe to surf tо my web-site . I've joined your feed and look forward to seeking more of your wonderful post. Also, I've shared your web site in my social networks! My wife, Bekka, and I just made two bottles of your bug repellent this morning while finishing the preparation of our July 4th menu. How can I make spray to get rid of termites? Need a spray for wasp and hornet bees. Try to built nests our rigs. And spiders and bees sneak in our metal storage shed. How do we keep them out? Wasps are a big problem in my area. Especially in the wooden house around my mailbox. I put a couple mothballs in my mailbox to deter them. My mail smells like mothballs, but no more wasps! I would buy one of those pump sprayers at the supply store of your choice. They come in smaller sizes. They have a nice spray pattern. Will work with all chemicals. Just remember to label it so. Silverfish...both kinds! I hate them! Also have found a few centipedes (supposedly harmless kind....UGH!) Do you have any recipes for these bugs? Young Living have amazing essential oils! I encourage everyone to check them out! I have been using for a short time with amazing results in all walks of health!! Bedbugs, do you have any recipes for these bugs. It has been an absolute nightmare. Had never had them ever in my life time and can't figure out how we got them. Please, any suggestions would certainly be appreciated. can I mix several of the suggested oils together or should I just stick with one of the above oils? Thanks for sharing this informative post. I want to buy a bug spray from here! We live in the country with woods all around us, and have a mouse and squirrel problem. Catch in traps quite a bit, but always seem to be more. Any essential oils or recipes for getting rid of or deterring rodents from your house?